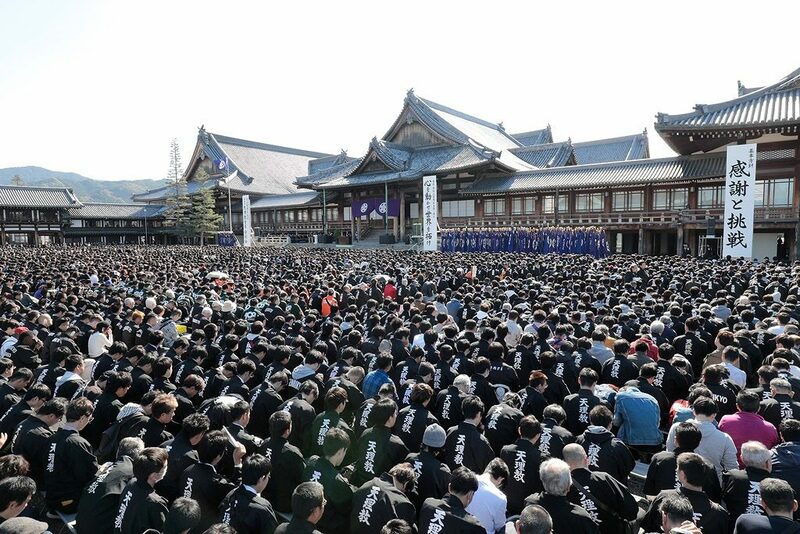 On October 28, the Young Menʼs Association held its 94th annual convention commemorating the 100th anniversary of its establishment in the Inner Courtyard of Church Headquarters, drawing some 30,000 participants including association members from both within the country and from overseas. On the convention day, the Home of the Parent was blessed with clear autumn skies. When the registration desks opened at 8:30 a.m., groups of association members began to come into the Inner Courtyard one after another. Thousands of folding benches set up in the venue were filled before the convention started. For overseas followers, simultaneous interpretation was provided in seven languages with a total of 308 wireless receivers being lent out. At 10:00 a.m., Young Men’s Association President Daisuke Nakayama escorted Harue Nakayama, Nobue Nakayama, and other guests into the Inner Courtyard. A moment of worship was followed by the hoisting of the association flag, the opening declaration, and the singing of the Eight Verses of the Yorozuyo. To close the convention, the members recited the Guiding Principles of Arakitoryo and then joined together in singing the Tenrikyo Young Menʼs Association Song. In the daytime, a variety of competitions were held in and around the Sanctuary precincts, such as tag rugby, futsal, shogi (Japanese chess), and dance and band contests. Meanwhile, on the east and west sides of the area to the south of the Main Sanctuary, many booths offering a variety of meat dishes were set up, and a number of attractions entertained not only children but also adults. In the evening, in the open space in front of the Oyasato-yakata’s East Center Wing, a variety of food booths run by diocese and directly supervised church groups, as well as stage performances, were provided.